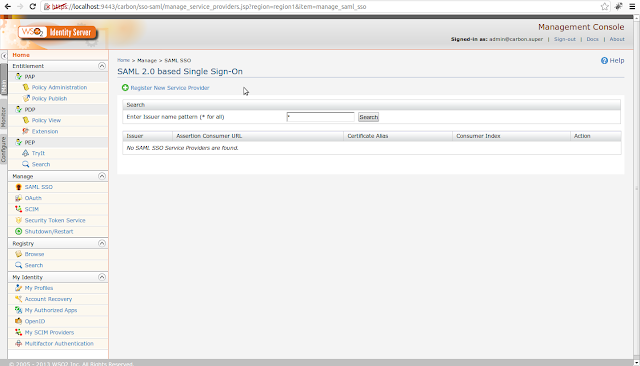 In this blog post, Suresh explains SAML 2.0 SSO behavior with WSO2 IS 3.2.3. WSO2 has released IS 4.5.0 recently and it contains many improvements to SSO. So here I'm going to explain the same scenario with IS 4.5.0. 1. Check out the source. 2. Go to sso/SSOAgentSample (checked out folder) and build the sample with following command. 3. After successful build, sample war file can be found inside sso/SSOAgentSample/target folder. Now we need to deploy this sample web app on a web container. Let's use Tomcat server. Since this sample is written based on Servlet 3.0 it needs to be deployed on Tomcat 7.x. 4. Stop the Tomcat server if it's already running. 5. Copy travelocity.war file to TOMCAT_HOME/webapps folder. 6. Start the tomcat server. travelocity.properties file inside travelocity.com/WEB-INF/classes folder can be used to change the properties like issuerID, consumer url and IdP url. For this sample I'm using default values. i.e. Now we've deployed the web app successfully on a web container. The next set is to configure WSO2 IS 4.5.0 as IdP. 4. 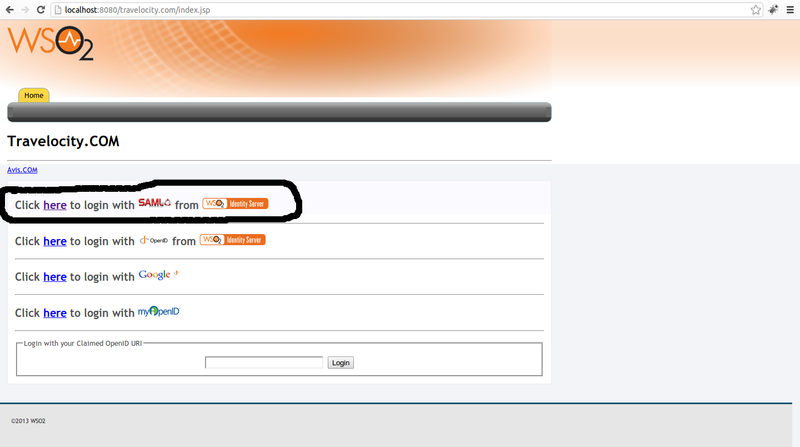 Click on "Register New Service Provider"
5. Register new service provider, providing following values. After providing above values click register. Below I've attached an image with configured values. 6. After successfully registering the service provider logout from management console. 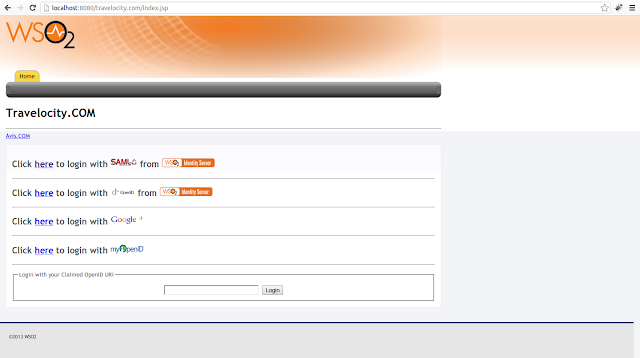 We've finished configuring IS as IdP. Now lets run the sample. 1. Visit http://localhost:8080/travelocity.com and you'll be taken to following page. 3. You'll be redirected to IS for authentication. 4. 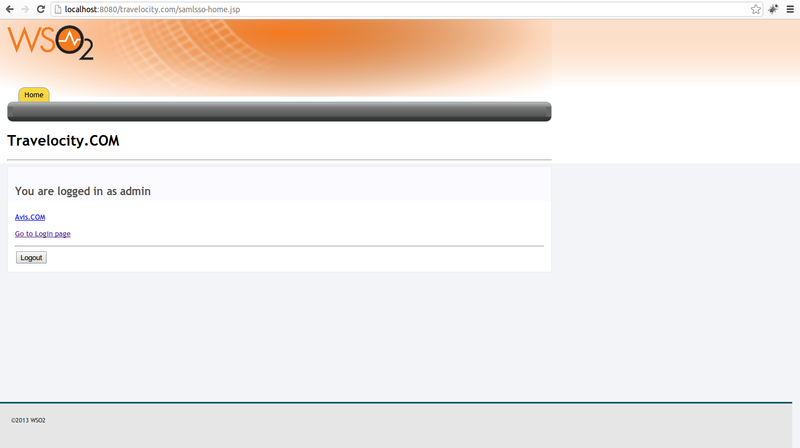 Enter default admin credentials (admin/admin). 2) Since single log out is enabled, if you click logout button in travelocity.com home page, you'll be successfully logged out. When the response signing is enabled, we are getting org.wso2.carbon.identity.sso.agent.exception.SSOAgentException: Signature validation failed for SAML Response error. Travelocity.com signed the auth request, that got validated at IdP and sent us the SAML response. 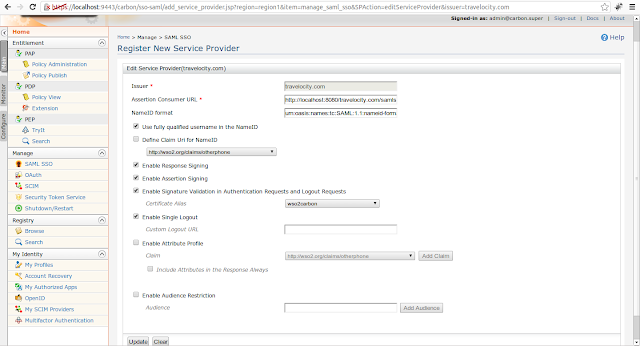 But SAMLSSOManager's validateSignature is trying to validate the signature of SAML response and throwing the above exception. Can you please help me how to overcome this issue? Does WSO2 support a use case wherein its a SAML service provider instead of being an Identity provider? hey hi I am getting "SAML2 Assertion not found in the Response" but once I check the debug logs I am able to see the SAML assertion response. 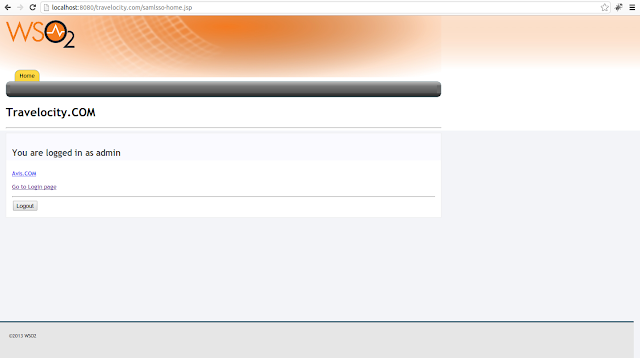 I am also getting "SAML2 Assertion not found in the Response", an idea how to resolve this? 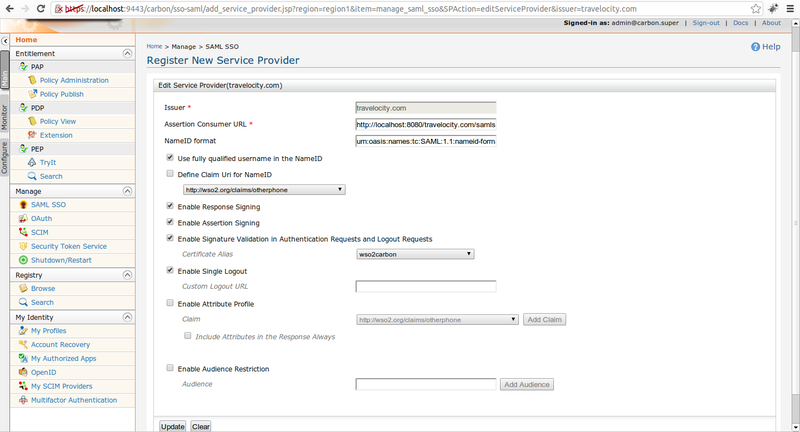 Any help here for the "Signature validation failed for SAML2 Response"? ?